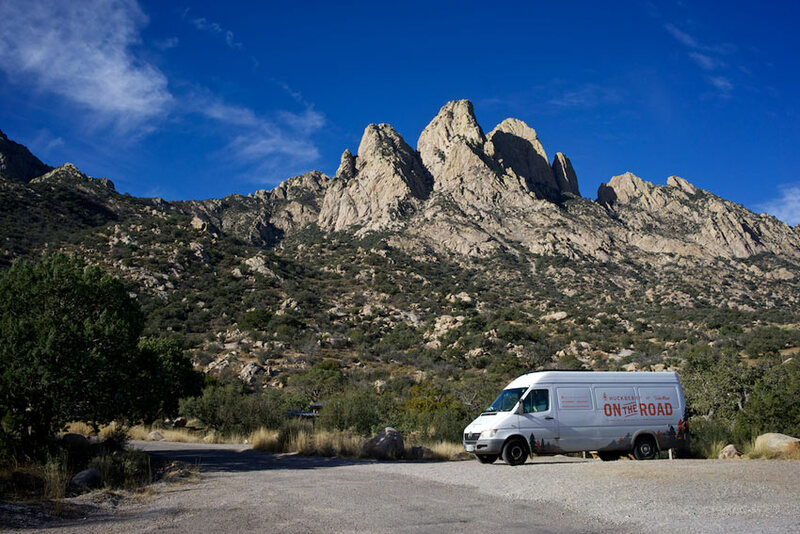 In the quest to streamline your camping trips, foil packet meals can be one of your greatest allies. It’s cooking at its simple best; you take some ingredients, wrap them up in a foil parcel, and place the pouch in a campfire’s coals to cook. 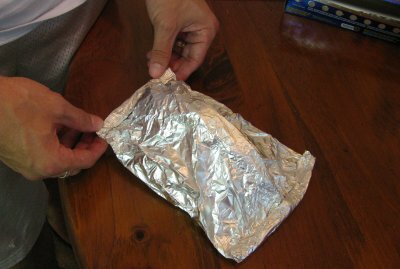 You can prepare these foil packets before you head out into Mother Nature, and they require no pots and pans, no plates, and no clean up. All you need is a fork and some fire. And, if you know what you’re doing, they can be incredibly tasty and satisfying. 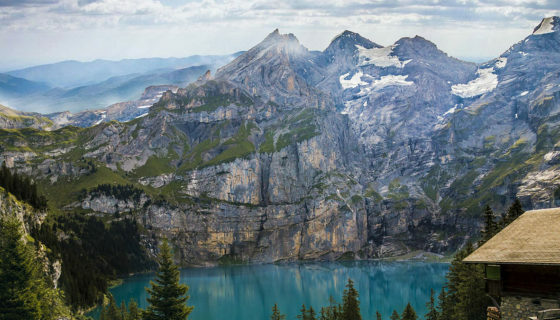 So today we’re going to cover the basics of foil packet cooking and provide you with some delicious recipes to try the next time you venture into the great outdoors. Use heavy duty foil. You don’t want the foil to rip and have ashes get in and your dinner leak out. If you use regular foil, double up on the sheets. If your food is heavy, and/or if you plan to eat directly from the pack, it’s a good idea to double up even on the heavy duty sheets. Spray the side of the foil on which you’re going to place the food with cooking spray before you add your ingredients and seal it up. When placing your ingredients on the sheet of foil, always put the meat on the bottom as it takes the longest to cook. Cook your foil packet on the fire’s coals, not in the fire itself. Ideally, you want to place the packet on a bed of coals about 2 inches thick. Hard, raw vegetables like carrots and potatoes take a long time to cook. If you don’t want to wait, use the canned variety. When cooking meat, throw in some high-moisture veggies like tomatoes and onions. This will keep the meat from drying out. 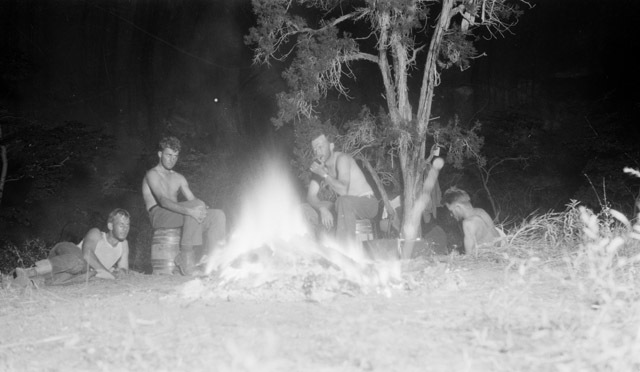 Cooking times will depend on how hot the fire is and the kind of food in the packet. I generally err on the side of cooking it too long-this is the kind of food that you don’t need to be overly delicate with. Flip the packets over a few times during cooking, and open and check on how the food is progressing from time to time. 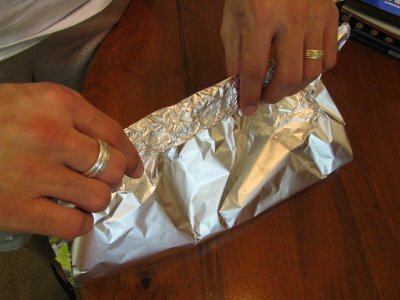 When it’s finished cooking, open your foil packet carefully, as it’s full of hot steam! Making a good foil pack is essential to foil dinner cooking success. 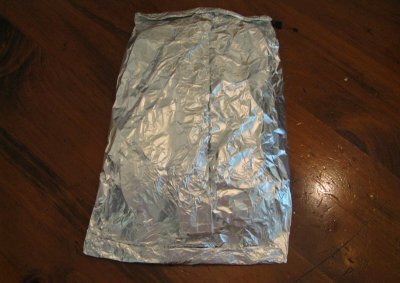 There are a couple of different kinds of foil packs you can make depending on what you’re cooking. The flat pack is best for foods like meat where you’re looking for more browning than steaming. 1. Place the food in the middle of the sheet of foil. If you needed to mix the ingredients up, do so in a separate bowl before transferring it to the foil. 2. Tear off a sheet of heavy-duty foil that is about twice as long as the food you’ll be wrapping. It’s better to overestimate the length than place your food on it, start wrapping it up, and realize you don’t have enough foil to keep everything in and make your folds. 3. Bring the long sides together in the center and crease them together, making tight folds until the foil is flat next to the food. 4. Tightly roll up the shorter sides until they meet the food. 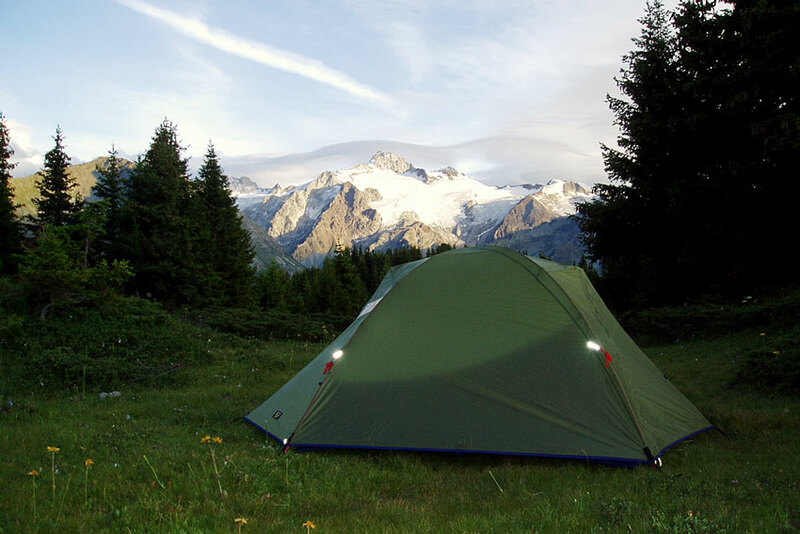 The tent pack provides a pocket of air that allows for greater steaming. Thus, it’s best for foods you want steamed more than browned like fruits, vegetables, and meat/vegetable combos. 1. Tear off a sheet of foil just as you would for the flat pack. 2. Place the food in the middle of the foil. 4. Tightly roll up the shorter sides, again leaving an inch or so of space between the end of the fold and the food. You don’t have to limit foil packet cooking to camping. All of these recipes are also good when cooked on the grill. It’s an easy way to grill veggies. 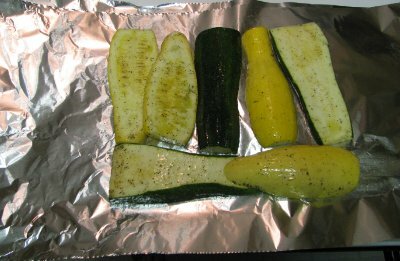 Above, I took some squash and zucchini and mixed it with olive oil, salt, pepper, and garlic. Very nice. I’ve tried to give somewhat exact measurements here, but honestly I just eyeball it, and I recommend doing likewise. Foil packet cooking is not an exact science. And these recipes represent just the basics-you can add all sorts of variations to them. The foil is your camping canvas and you can do whatever you’d like with it. All servings are for a single person unless otherwise indicated. Just double or triple the measurements according to your needs. This is my go-to foil dinner recipe. Mix together the above ingredients with spices and condiments to your heart’s content. Place the mixture on the center of a sheet of foil, wrap in a tent pack, and place on hot coals for 25 minutes. Crimp the sides of your sheet of foil so that the eggs won’t go anywhere when you add them. First place your hash brown patty on the foil. Then place the eggs on top of the hash brown patty. Then place the sausage patties on top. Season with spices and condiments and wrap up in a tent pack. Place on hot coals and cook for 15 minutes. Add the cheese when it’s ready (it turns out better than cooking it in the pack). Making muffins this way isn’t actually easier than baking them up at home, but it is infinitely cooler. Mix up the muffin mix as instructed. Cut off the quarter top of the oranges. Carefully scoop out the pulp; do not break the skin. Pour the muffin mix into the oranges. Wrap the oranges in foil, crimping the foil around the hole at top of the shell, but leaving it open. Place the oranges upright in a stable position on hot coals and cook for about 10-15 minutes. Makes six servings. Well, if you’re someone who can stop at one muffin. Note: You can also cook eggs this way, but you’ll want to cover the whole orange shell with foil. Pound the chicken thinly as chicken can take awhile to cook. Mix together the broccoli, soup, and cheese. Add spices and condiments. Place the chicken breast on the center of the foil. Top with the soup mix and then rice. Seal in a tent pack. Cook on hot coals for about 25 minutes (The thicker your chicken breast, the longer it will take). Mix the melted butter with a dash of lemon juice and the above spices to taste (with the exception of the paprika). Place the onions on the foil sheet. Place the fish on top and sprinkle with paprika. Wrap the foil in a flat pack. Place on hot coals and scoop some hot coals on top of the packet. Cook for 15-20 minutes. Mix together the apricot preserves, the soy sauce, and any seasoning you’d like to add. Place the pork chop in the center of the sheet of foil. Spread half of the apricot sauce on top. Put the veggies on top/around the pork chop. Pour the rest of the sauce over the whole thing. Wrap in a tent pack. Place on hot coals and cook for 20 minutes. Place turkey cutlet on sheet of foil. Put the stuffing on top and the green beans around the cutlet. Pour gravy over everything and sprinkle with the dried cranberries and seasonings. Wrap in a tent pack and place on hot coals for 20 minutes. Place the ears of corn on a large sheet of foil. Spread the butter on top. Sprinkle with the seasonings and Parmesan cheese. Put the ice cubes on top. 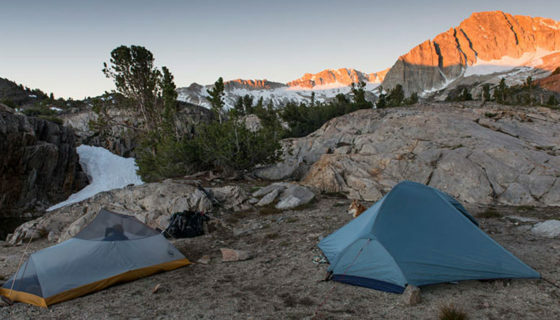 Wrap up into a tent pack. Place on hot coals and cook for 20 minutes. Makes 4 servings. Every delicious foil dinner deserves a delicious foil dessert. This is an awesome one. Place donut on sheet of foil. Mix the softened butter and brown sugar together and spread it over the donut. Place the pineapple ring on top. Wrap the donut in a tight flat pack. Place on hot coals and cook for 5-7 minutes. What are your favorite foil packet meals? Share your tips and recipes with us in the comments!